Begun in 2018 and currently under construction, this cottage will total approximately 1350 sq. ft. of gross living area and over 800 sq. ft. of porches and decks. 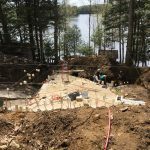 This cottage build is contoured around the bedrock on the site. The ground floor will contain 2 bedrooms, 1 bath, and common foyer, living, and dining areas. 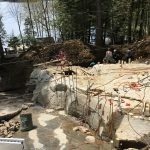 Both the master bedroom and living area will provide egress onto the lakeside deck, while a patio door located in the dining area will lead to a side-facing BBQ deck. Vaulted ceilings are used to help accentuate the great room. The split-level walkout basement contains 1 bath, a sitting room, recreational room, laundry room, and a utility room. 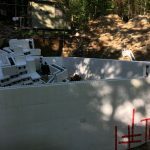 An insulated concrete form (ICF) foundation is pinned to the existing granite bedrock. Engineered floor and roof systems make up the structure. Stay tuned for additional photos. 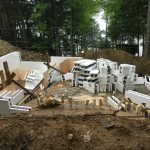 This entry was posted in Gallery, Portfolio and tagged Armour, basement walkout, Bedrock, cathedral ceiling, cottage, Covered Porch, Deck, elevated, I joists, ICF, Piers, stairs, trusses. Bookmark the permalink.